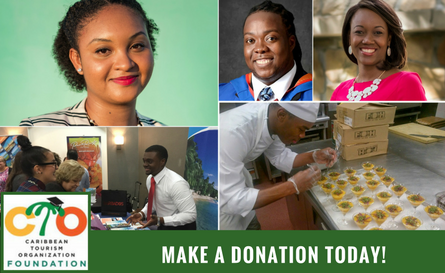 By clicking on the DONATE button, you are providing much needed financial assistance to Caribbean nationals who want to acquire the necessary knowledge and skills so that they can contribute to this dynamic tourism sector which contributes significantly to the quality of life of the peoples of the Caribbean. Click the link below to make a donation of your choosing to the CTO Scholarship Foundation. The Caribbean Tourism Organization (CTO) Foundation is a 501c3 entity established in 1997 to provide study grants and scholarships to Caribbean national to study tourism and languages. Its objective is to build capacity and develop a cadre of tourism professionals that will lead Caribbean tourism to realize its full potential. The Foundation is seeking your assistance with its fundraising efforts. With no single major corporate benefactor, the volunteer Foundation Board stages a number of events, in collaboration with industry partners, to fund this cause. To date, the Foundation has raised over $1 million in scholarship funds and provided grants and scholarships to over 250 students from across the Caribbean. There is great demand for the scholarships from very qualified individuals and it is the wish of the Board to be in a position to accommodate all of the applicants. Regrettably, because of inadequate funding, the Foundation is forced to deny qualified applicants who may never realize their dream of a career in the tourism industry. We need your help. All funds raised are spent exclusively on scholarships as CTO assumes the cost of overhead expenses for the Foundation. Your participation will move us closer to meeting our goal of providing even more scholarships, enhancing our tourism business and equipping the region to provide professional services to our nationals and visitors. CARIBBEAN TOURISM ORGANIZATION FOUNDATION, INC.
Download (pdf) Hotel Stay Donation Form. Download (pdf) Auction Item Donation Form. We wish to contribute a hotel stay to the CTO Foundation's fundraising efforts. Please attach the certificate using the upload button below. Are children included in the number of guests? If you answered YES above, how many children and what age range? Are there additional fees per child? If so, what are they? When is the original certificate required? Does the stay include meals? What is the change/cancellation policy? What are the blackout dates? We wish to contribute the following item to the CTO Foundation's fundraising efforts. Please attach the certificate using the upload button below. What is the expiry date, if any? What is the change/cancellation policy, if any? What are the blackout dates, if any? Please indicate the type and percentage of taxes and/or fees, if applicable.